The technology exists, the Supply Chain Management (SCM) solutions are proven, why aren’t companies eating it up? Seeing businesses struggle daily with inefficient supply chains and a plethora of external processes to patch holes, gather costs and “sort of, kind of” see what’s coming in and going out can be frustrating. Companies can sometimes grow so fast and stay so focused on their product that it is easy to overlook evaluating the additional costs and labor hours lost due to lack of investment in technology. Today, it has become the norm for companies to postpone technology evaluations for 1 -2 years, and tighten belts due to the suffering economy. However, in many cases, InterDyn - Remington Consulting would disagree with this approach because we know our Microsoft Dynamics SCM solutions can rid your current systems of inefficiencies and prepare you for growth. Implementing Microsoft Dynamics allows organization to be nimble and agile, making it easier for competitive companies to ready themselves for acquisition and scalability. By streamlining your internal processes you will not only increase profits, but also improve client satisfaction. And isn’t that what it is all about? Microsoft Dynamics GP simplifies and accelerates complicated supply chain processes, such as tracking and coordinating resource availability and inventory to reduce customer order lead times. By connecting inventory control with purchasing and sales order processing, Microsoft Dynamics GP helps you maintain the right stock at the right time. Dynamics GP also makes it easier for customers and business partners to do business together when partner and customer portals are implemented. Finally, the system can provide clear, up-to-the-minute visibility into your entire manufacturing organization, including customer demand, factory activity, order status, service information, customer data, financial reporting, supplier information and more. You will provide everyone important to your business success with current, reliable information and make important business applications always available. Learn How to Automate Your Brewing Business Basics! What’s New in Microsoft Dynamics GP 2015? 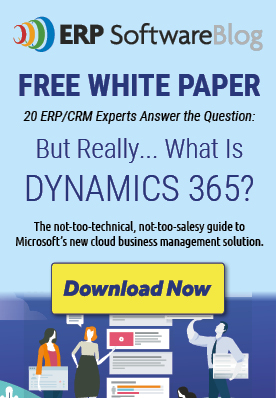 Why Are Microsoft Dynamics GP Customers Moving Their Solution to the Cloud?